There’s a lot of talk of the uncertainty of exact track of Hurricane Irma as it nears a potential U.S. While we do our best as meteorologists to forecast an exact path of a given storm, there are countless factors that go into determining a given path. The MISR instrument on NASA’s Aqua satellite is comprised of nine cameras that view Earth at different angles. By combining two of MISR’s images of Hurricane Irma, you can get a 3-D look at the storm. You’ll need red-blue glasses to see the full effect. 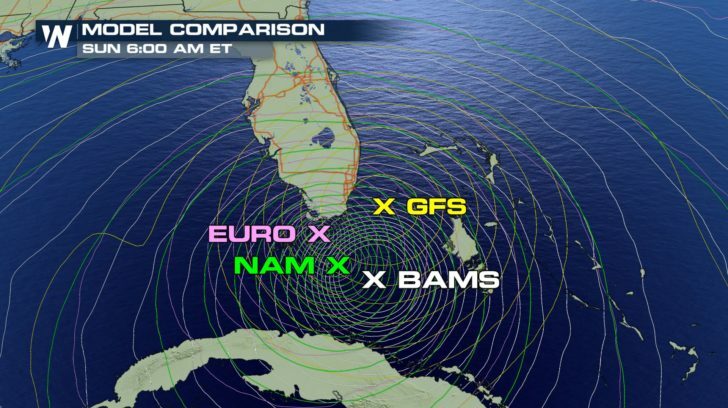 The best forecasters of a potential path are at the National Hurricane Center. Forecasting tropical systems is what these men and women do, so it only makes sense that they do it well. 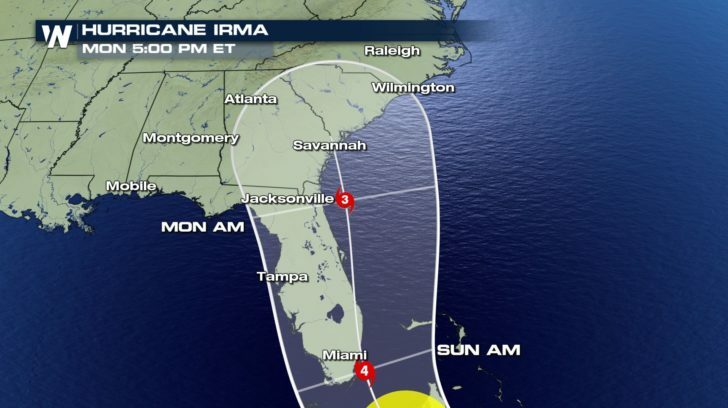 Keep in mind the cone is the possible path track. It could still stray to the far eastern or western side of the forecast cone, drastically changing the impacts of the storm on the southeastern U.S.
For those that want something more, we can take a look at the individual models that go into the complete forecast. 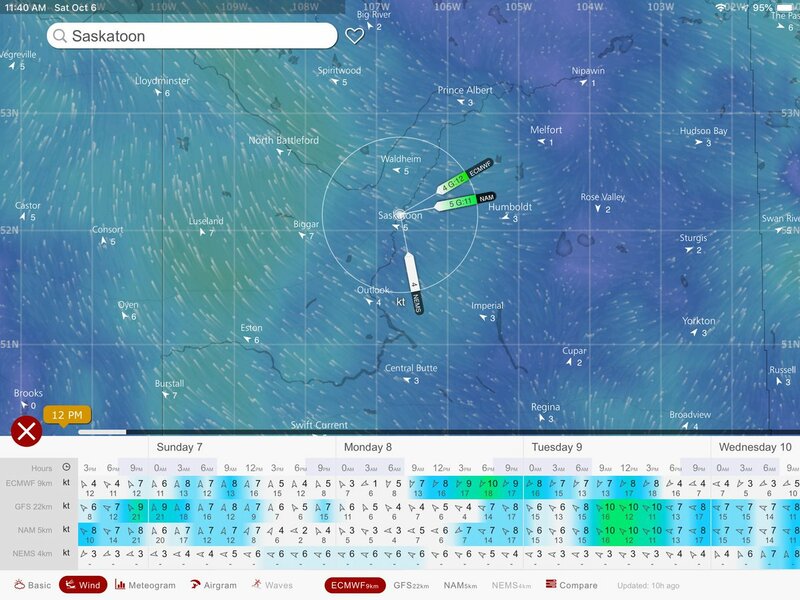 GFS: Global Forecast System. 13 kilometer grid covering the entire planet factoring in numerous variables to predict weather out to 16 days. NAM: North American Mesoscale Forecast System. 12 kilometer grid covering the North American continent, with the ability to run high-resolution forecasts. EURO (ECMWF) European Center for Medium-Range Weather Forecasts. 9 kilometer grid and historically one of the most accurate models in tropical forecasting. BAMS: Baron Services proprietary model used by WeatherNation. 15 kilometer forecast grid used in this model run. Through Saturday morning these 4 models are less than 40 miles apart. Sitting between Cuba and the Bahamas. 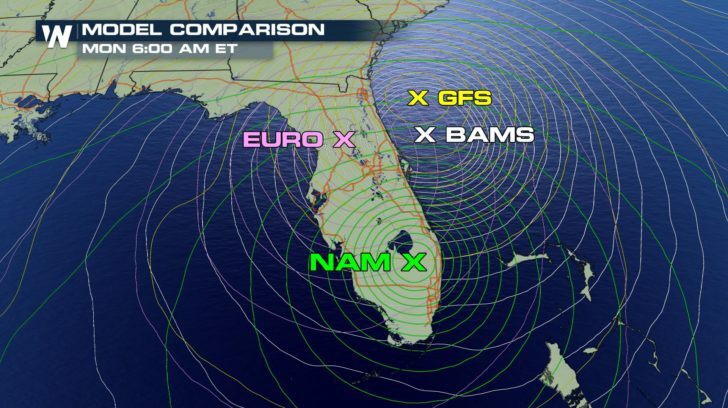 By Sunday morning the different forecast movements start to become more prominent. Still no more than 100 miles apart, there is agreement on path– speed becomes the separator. 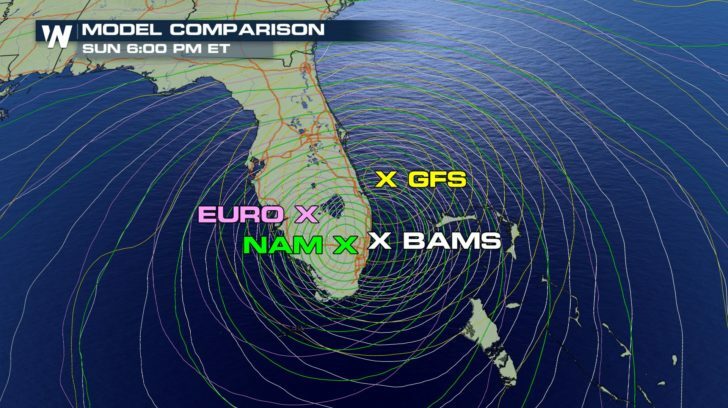 By Sunday afternoon both the EURO and the NAM make a southern Florida landfall while the GFS and BAMS stay off the east coast of Florida. 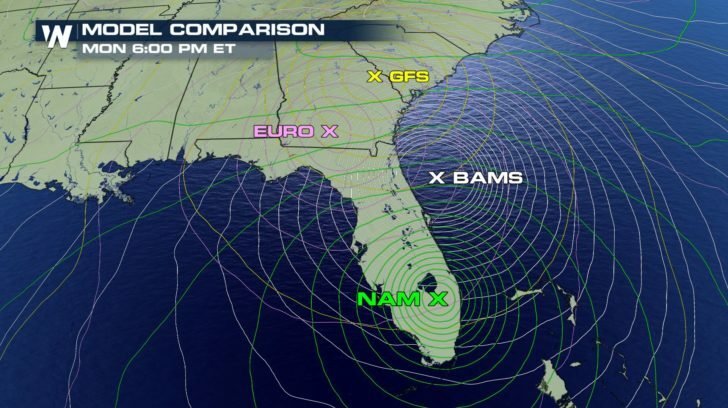 Sunday evening both the NAM and EURO move inland while the BAMS nears the Miami coastline. The GFS remains offshore and speeds up with no land interaction. Monday morning the models start spreading out. Tens of miles turn to hundreds of miles as land makes its mark on the storm’s speed. To be perfectly honest, the faster and farther offshore the better. By Monday evening even more so. 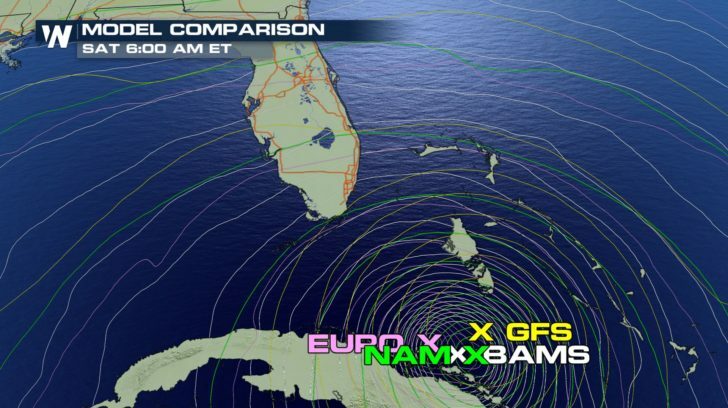 The most accurate forecast at any time will be the National Hurricane Center’s forecast cone. It is updated every few hours throughout the day alone with advisories from around the region. 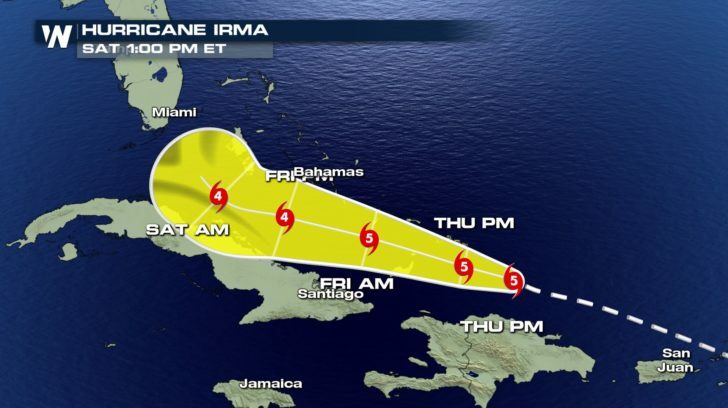 USA Today : Hurricane Irma track: Which forecasting model is most accurate? CBS news : Hurricane Irma track: Which forecast model should you trust? 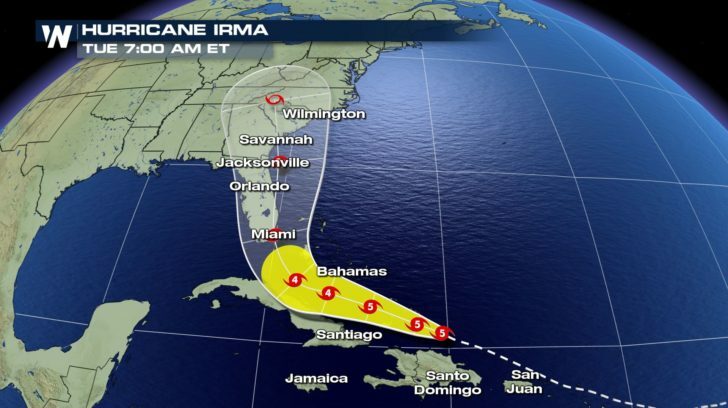 CNN : Hurricane Irma tracking / What's with all these hurricane forecast models?